100% Pure acetone - Even though for removing nail polish I use my acetone with glycerin mix, for clean up I prefer to use pure acetone. 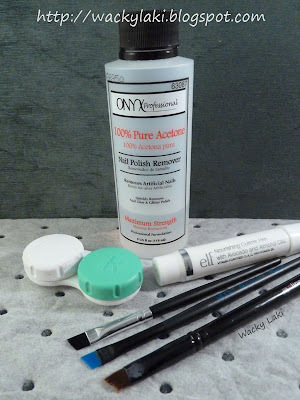 This is what works best for me, but this technique will work with other nail polish removers, if you are not an acetone fan. Eyeliner brush - I have tried different brushes for clean up and find that the shape and flexibility of this type of brush works best for me. However, I suggest experimenting with different brushes to find one that works best for you. Contact lens case - Any small, airtight container should work. I happen to have lots of contact lens cases around, so I dedicated one to manicures. This allows me to reuse the acetone for multiple manicures. I just keep adding pure acetone when it runs low and I like that I don't have to waste it after each clean up because it has a cap. The right side of my contact case has acetone and the left side has water. 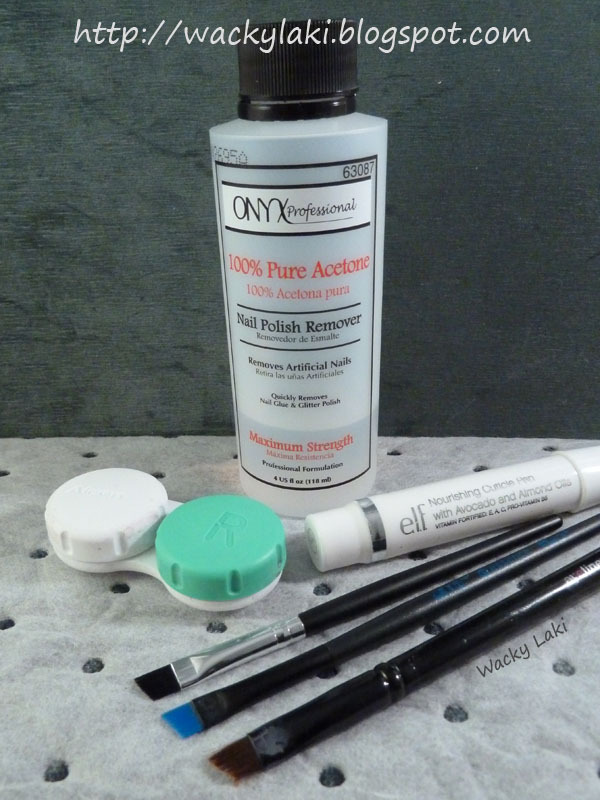 I use the water to rinse the acetone off the brush after using it. This helps extend the life of the brush. Cuticle Pen - This is my favorite way to moisturize the cuticles after pure acetone. I use the Elf Nourishing Cuticle Pen that I get for $1 at Target. It has a stiff tip that allows me to apply the oil while the polish might not be completely dry yet without ruining the manicure. A closer look at the brushes. All of these are inexpensive eyeliner brushes and all work equally well. I like the eyeliner brushes because they are flat and easily fit the contour of the nail. Top - This is a Wal-Mart store brand brush. It is inexpensive, but the bristles fall out extremely quickly (quicker than any other brush I've used). I bought a few at once so I have a new one to show here, but I rarely use this brush now. Middle - An Essence brush. This brush works very well and so far has held up perfectly to acetone. - Note: I go through the clean up steps prior to adding a top coat, but you can choose to apply a top coat before the clean up. I find that cleaning up before the top coat works better for me for two reasons. One, while I'm doing the clean up, the nail polish has time to dry and the topcoat doesn't bubble as much as it does over fresh polish. Two, the top coat is more stubborn to remove so it makes the clean up process longer. - Pour some acetone into a small container (it is slightly pink in the photos from a previous manicure). 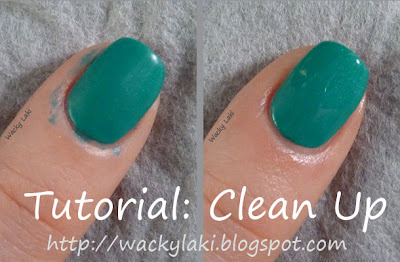 - Run the brush along the side of the container to get rid of excess acetone. This helps ensure that the cuticles don't get flooded with acetone and ruin the manicure. - Allow the nails to dry and enjoy! I hope found this tutorial useful. Please let me know what you think of it! So glad you shared this! This is exactly what I do except I never even thought about using a contact lens case.. That is purely genius! I will definitely have to do that. Fantastic, I now know what I need to pick up on my next target run! Thanks for he info. great tutorial. i have just started doing the same thing, except i don't use a cuticle oil pen. i've been wanting to get the elf one. do you recommend it? Thank you so much for putting this up! I have been struggling with q-tips to get my nails clean, I never thought of using a brush! Thank you again! Great idea! The contacts lens case is such a great idea that I'm definitely going to use now. I'm going to try this next time I clean up my nails. This is totally handy (hee hee) I always try to clean with a Q-tip, smudge city. Thank you! I feel like I am the only person on the planet who doesn't do this clean-up! I just use my fingernail to make a cleanish line around the cuticle. I am too uncoordinated to do the brush-and-acetone thing--I just end up taking off a huge chunk of polish. I've had the same experience as Ritterbraten: the Essence eyeliner brush started to shrimp after each time of use... And suddenly it got bold. A very easy way I use to clean up my nail polish on fingers and cuticles is with a pencil eraser. After the polish is dry, it easily rubs it off. That's a very nicely put together tutorial! Great tutorial! I always wondered how you got them so clean and neat without ruining the manicure. It always takes me forever! I'll definitely be giving your method a try! Thanks again! I'm so glad that this tutorial was useful! Thank you for all your wonderful comments and input! @joycelyn, you are so welcome! @Pink Tattoo, yes I do recommend the elf pen. I use it after every manicure and love it. @KimsKie, my brush hasn't gone bald yet, but I'm sure it will since it did for both of you. I use my Target brush most of the time. @Anonymous, that is so interesting, I have not heard of this method before. Thank you for sharing! @Nailstyle, thank you so much! Great tutorial! I love the color you're wearing too! 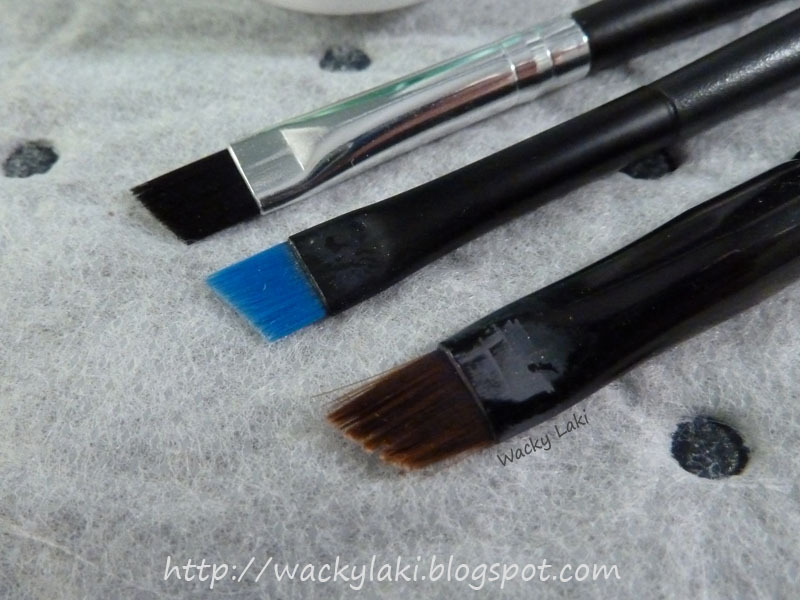 I use the same angled eyeliner brushes, they work so well! I like your step by step pics. I never thought to use an eye liner brush. Thats a great idea, Thanks. Fab tutorial! I have the same brush, same contact case, and same acetone! Great minds think alike ;) Love this method. Thanks for the post! Thank you . . .the q-tip was not working for me! Thank you for the tutorial! Attempting to clean my cuticles with q-tips was not working. I don't have contacts so I picked up a couple little round travel things at Walmart. I put the acetone in and it started eating the containers! It made them glue to my table! I don't know what they were made of but just a tip to be very careful what you put pure acetone in! @Trixie, oh no! I'm sorry it melted your container. The contact lens cases are holding up really well. I'm using the same one for over a year now. Thank you for the tip! I'm sure it will help someone avoid the same problem! I love this method. I was using one of the remover pens at $5+ a pop, and the tips break off too fast. I use the same brush from Target, and it works perfectly. Can't beat it for $1.90. So much better than the Walmart crap, and cheaper, too! This is a great tutorial, I just need to hit target now! I'm glad you enjoyed this tutorial! I use the exact same technique for cleaning up my left hand as I show here. For cleaning the right hand, sometimes it helps to hold the brush still and move my nail rather than moving the brush. Thanks for this. It has answered several questions I had about cleaning up my fingers after doing my nails. I appreciate your sharing it with us all. It will definitely make my manicures a lot more pleasurable to do each week. Can I ask how you get the brushes themselves completely free of polish when you are done using them? I've been using brushes for a while but they are so stiff because I can't seem to get them very clean. I'm just using acetone and wiping them with a paper towel. Would some sort of oil work? Hi! Thank you very much! I'm glad you enjoyed this tutorial. My brushes also get stiff also from the acetone. I make sure to rinse them well in acetone when I'm done. Although they do get stiff, but soften right up when I dip them in acetone again. Since these brushes are dedicated to clean up only, I don't worry too much about them getting stiff.